Last month (FRONT of HOUSE, March 2018, page 41), we took a crash course in audio crossovers. This month, we’ll discuss crossover parameters. Crossovers are basically a series of filters, and the simplest crossovers are a combination of high-pass and low-pass filters. 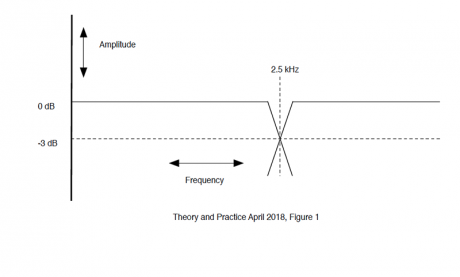 (Sometimes a really simple crossover can be built using a single capacitor to create a high-pass filter, but that’s not something we would normally find in sound reinforcement). Filters are necessary because it’s difficult — if not impossible — to seamlessly join together the output from two different drivers without overlapping. The goal is to make sure that when the drivers are acoustically combined, they produce a smooth frequency response. By definition, the “crossover point” is the frequency where the filters intersect and are -3 dB down from flat. Fig. 1 is an illustration of a two-way crossover. It uses a high-pass filter to feed the tweeter and a low-pass to feed the woofer. The flat line represents 0 dB, and the crossover point in the illustration is 2.5 kHz. At 2.5 kHz, each driver is -3 dB down, which is one-half of the power output per driver. In this region, the acoustic output of the two drivers adds together to fill in the 3 dB “hole.” That usually restores flat response. Fig. 2 illustrates a three-way crossover, where the crossover points are 250 Hz and 2.5 kHz. The middle region represents the output to a midrange driver and is called a bandpass filter (because it passes a certain band of frequencies). The next important parameter is called slope. This is the rate at which the level to each driver is cut. We express slope as a number of dB per octave. Fig. 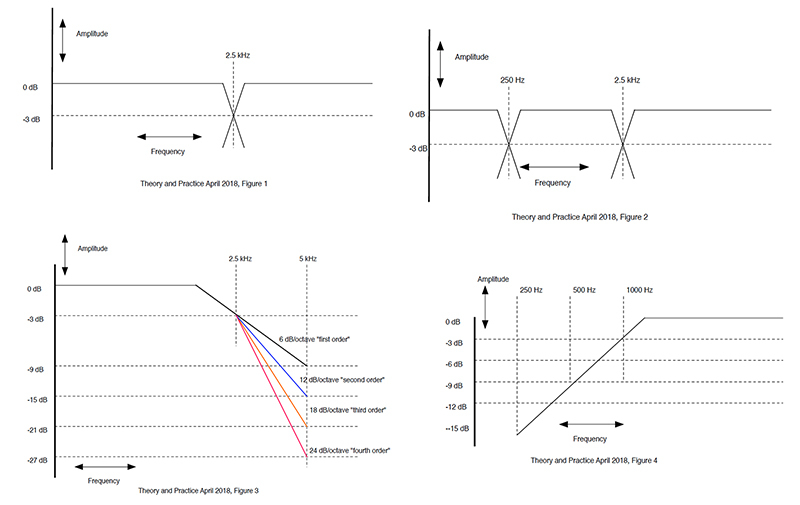 3 shows how a low-pass filter looks with different slopes. All of the curves have the same cutoff frequency of 2.5 kHz. The cutoff frequency (sometimes called the “corner” or “turnover” frequency) is where the filter is down -3 dB. 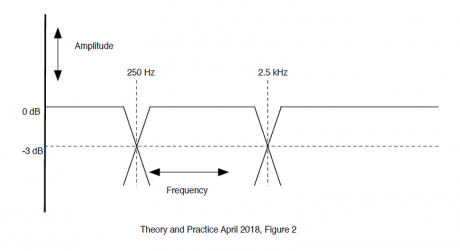 Since slope is expressed as dB per octave, we want to see what is happening at 5 kHz — which is exactly one octave above 2.5 kHz. The black curve is what we call a “first order” filter. It attenuates the high frequencies at the rate of -6 dB per octave. The blue curve is more severe, with a rate of -12 dB per octave (“second order”). The slope of the orange curve is -18 dB per octave and is known as a “third order” filter. The red curve has a slope of -24 dB/octave, which is referred to as a “fourth order” filter. In theory, we could create a filter with an infinite slope or a “brick wall” — and it would prevent any overlap at all between frequency ranges, simply stopping every frequency above or below a certain number from reaching the driver. 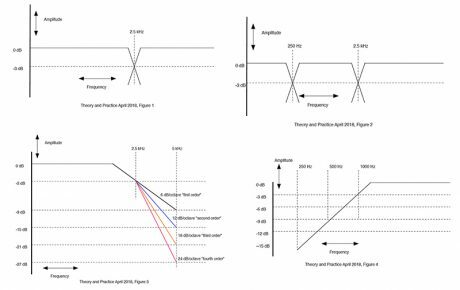 But — as has often been said here — theory is not practice and even if we could create true brickwall filters, your ears would be very unhappy with the resulting phase shift and distortion. Slope is a very important parameter, as it determines how much of the frequency range is allowed to “leak” into a driver. Let’s suppose a two-way crossover has a high-pass filter with a cutoff of 1,000 Hz and a slope of -6 dB/octave (Fig. 4). 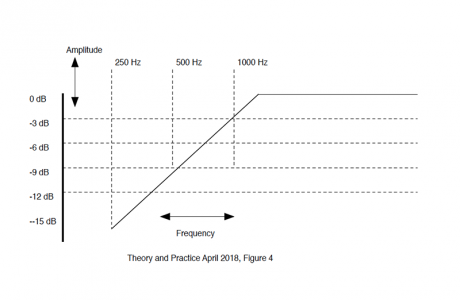 That’s a very gentle slope, so a frequency of 500 Hz (one octave down from 1,000 Hz) is reduced by only -6 dB; and a frequency of 250 Hz (one octave down from 500 Hz) is reduced by only -12 dB. 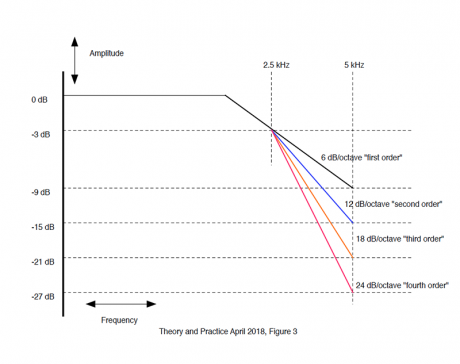 That audio at 250 Hz could be enough to damage the diaphragm of the tweeter, so a steeper slope like -18 dB/octave may be more effective in protecting the HF driver. That’s why it’s important to know the manufacturer’s suggested crossover points for the transducer, and most manufactures publish such data. A very rough guideline for those of you who aspire to build your own speaker cabinets and crossovers is that you can probably move the suggested crossover point higher, but moving it lower could cause damage to the transducer. Luckily, we aren’t required to calculate crossover points from scratch these days. Manufacturers of powered speakers have done most (if not all) of the homework for you. Many powered, full-range speakers have built-in filters that were designed to work in conjunction with the filters in complementary powered subs to create an accurate crossover. Other systems may require the use of a “drive” processor for help. For example, consider the dbx Drive-Rack VENU360 loudspeaker management processor. It features the ability to create system processing for a variety of bi- or tri-amped P.A. systems and includes data for a wide range of loudspeaker brands and models. So if you are running a P.A. consisting of low, mid and high-frequency drivers, you can dial up the brands and models and the device knows the suggested crossover points. The VENU360 will then build a crossover profile with appropriate high-, mid-band and low-pass outputs for the respective drivers. If you choose to roll old-school, you can do all this manually and then measure the results using pink noise and an RTA. Of course, you still have to make the connections properly. Don’t blame me if you connect the low frequency outputs to your HF drivers! Steve La Cerra is the tour manager and FOH engineer for Blue Öyster Cult.